I've downloaded the Auto-Installer.Deluxe.v4.53.Xbox-Hq.iso from the VIP server and just working my way through the instructions. It talks about a .rar file with all the extras you can choose to add to the .iso - However I cannot locate this .rar file anywhere. Is it now built into the .iso or am I looking in the wrong places? I haven't downloaded this particular package myself so I do not know exactly what it has included. But if it is like the v4.53 packages I have used you will have a PDF manual which describes how to use the ISO Updater which should have been included. The ISO Updater creates a new AID ISO which includes whatever Addon Packs you have decided to use. The Addon Packs available should be in a folder included too. Those are probably what you are referring too. You can also create your own Addon Packs (skins for example) but you apparently need WinRAR for that ie. you can't (?) use .ZIP files even though many of the RAR Addon Packs actually contain .ZIP files. 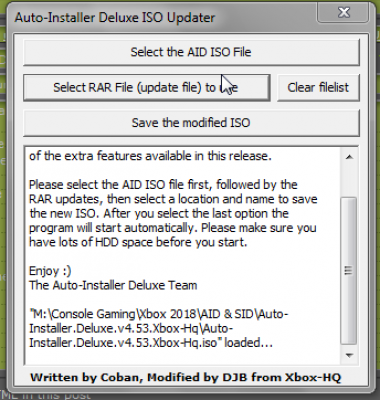 Please take note of the information in the manual because some of the Addon Packs must be queued in the right order when using the ISO Updater tool. Was reading though the manual and do have the ISO Updater - Just can't find the .rar package to extract to get all the options to build into the ISO. Do you have an Addons folder? I can't find the exact part in the manual you're referring too but I think it must mean the Addon Packs folder. When you launch the AID ISO Updater tool it gives you the GUI shown in Screenshot 1. To demonstrate I've added the original AID ISO by using the top button and browsing to its location. Screenshot 2 is what you should see when you click the button: 'Select RAR File (update file) to use' and browse to the Addon Packs folder. They are all RAR folders ie. the RAR archive. They will be added below the AID ISO details. Remember what I said about adding them in the correct order. Once all that you want are added click on the 'Save the modified ISO' and it will build the new ISO incorporating the Addon Packs you've listed. You can check the ISO has been updated by looking at its size in comparison to the original. But if you want to be certain you can open the ISO file to view its contents, known as extracting the ISO, using either Qwix or the C-Xbox Tool. It should work without a hitch and the ISO can be burned using ImgBurn or whatever you prefer. Only use DVD-R media unless you are are 100% certain about your Xbox disc drive's media compatibility. 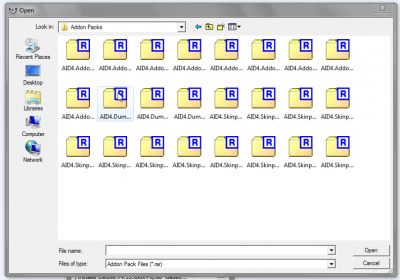 The Addon Packs folder contents when opened using the AID ISI Updater. AID ISO Updater GUI. As can be seen the original AID ISO to be updated has already been added by clicking on 'Select AID ISO file' button at the top. The .iso file is 1.1GB - Is this likely to have everything included on the disk and thus no .rar folder with the extras? That has the full update pack and everything else. From the sounds of things you snagged 4.53 LITE which is just the ISO no update packs. Yes, use SPPV's link and get the full AID v4.53 package. about Lite's content a long time ago and I specifically mentioned the Addon Packs it comes with. Some are pretty much essential anyway, like the DHCP patch, and my gripe was that the PDF manual, specifically for the Lite version, had the section about how to use the ISO Updater (also included) removed. That made no sense as the Lite package I downloaded included both the Addon Packs (minus the full version's dashboard skin packs, music etc) and BIOS files. It certainly wasn't as pruned as DaveUK83 v4.53 download. It makes less sense in this case to include the ISO Updater tool but no Addon Packs. I'll see if I can find my Lite download which I may have archived somewhere........... I did and much of the contents, as you'd expect, are exactly the same as the full version. It should have an Addon Packs folder, three BIOS folders, PC Tools and, I think, SID v5.11 too. 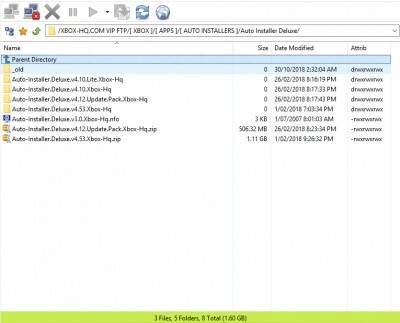 So there is something off with the contents of that original download. It is definitely not even the full Lite package. Thanks for that as usual. It is slightly bigger than the AID v4.53 Lite package I have. Zipped that is 486MB and unpacks to 590MB but it was downloaded almost six years ago so I guess it has probably had its contents updated since. I might grab the 'new' smaller version myself as I like to have AID Lite installed as an app on my Xboxes in E:\Apps.It a good way to make use of the limited E:\drive space whether you have a larger HDD or not. Chances are its just a difference in compression formats or compression level. Most of the AID/SID files here are RAR format where as mine is ZIP. Mine is from our old FTP server and was one of those annoying 97 part RAR files which I never use. Rule #1 for the GREPO is no multi-part archives. I think I may have an explanation for DaveUK83 original problem. When I downloaded AID Lite using that link my AV (anti-virus) flagged many of those files/folders missing from his original download as items that could not be scanned. This included all the BIOS files, shadow.img, the Addon Packs dummy files and some other stuff too although not specifically the Addons Pack folder. Anyway it occurred to me that the AV default setting could be to delete 'suspicious' files and even the folders they're in rather than sandbox or, more importantly, ask the user what to do with them. One of the things you have to get use to when dealing with Xbox tools' downloads is that many of them will cause AVs to flag them like this. Sometimes it reports them as PUPs (Potentially Unwanted Programs) simply because they're of low rep (reputation) ie. they're simply rare. Others may even be reported as possibly a generic virus. Auto-Xbins, Xbox font converters, video/image format converters and even C-Xbox Tool's XDIMaker will all provoke AV warnings of one sort or another. You should not be complacent but you can be pretty sure that anything download from a reputable source ie, from here is OK. You just have to accept that with some Xbox stuff you're going to get AV warning messages at the very least. In this case, if I'm right, the problem will actually repeat even if DaveUK83 uses the link provided. He may need to change his AV settings to stop them being deleted as I suspect may have happened with his original download. I have the older ones here somewhere. I still have the original DVDs that DJB gave to me. I think I packed them away in the back room because I was getting ready to move but that's not happening for a little while now. 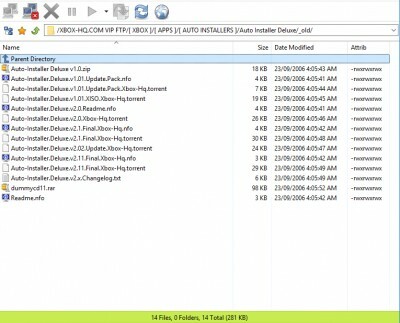 Below are some screenshots of the Xbox-HQ VIP FTP Auto Install Deluxe folders.